God is Love and no human can come into a true relationship with him unless they have His Love, the Divine Love in their soul. This is what redeems humans from the way of sin and error that they are naturally prone to in their earthly life, and from sin’s consequences in the spirit world. The Divine Love can be freely obtained through a sincere prayer in response to the longings of the soul (not just the desires of the mind and intellect), and faith that the Father will bestow it. The intellect cannot unite a person with God – only the soul, made in divine image or likeness, can make this connection. However, the likeness is only perfected by filling the soul with the Divine Love of the Father. Love makes the whole universe run in harmony – without it, all would be chaos and unhappiness. Only the Divine Love can unite God and humans, and enable humans to become divine angels with access to and abode in the Celestial Spheres. The Holy Spirit is the sole instrument that can bring about the salvation of man by imparting the Divine Love. Without the Holy Spirit, no man can be forgiven and enter the Celestial Heaven. Resisting and rejecting the influence of the Holy Spirit consists of sin against the Spirit and as long as this persists, the person cannot be forgiven – it becomes the unforgivable sin (Matt. 12:32). The Divine Love is an unconditional love regardless of the status of another being. It is the Love that God loves the world with. Jesus taught his disciples to love one another with the love that he had for them – which was the same as the Love that the Father loved him with (John 13:34-35; 15:9-13; 17:23). He also taught them to love and pray for their enemies. Doing this, they would be becoming perfect like the Father, who showers favors on both the just and the unjust, is perfect (Matt. 5:44-48). Growing in the likeness of the Father and having their souls transformed from the image of God into divine substance, they would be becoming more and more at one with God. Human love is a mere shadow or image of the Divine Love. It is the love we are born with and develop as we grow up. It is manifested through, for example, motherly love, sibling love, married love, and love for friends. In expressing love to God, it is in obeying God’s commandments – but may not go much beyond that as shown by the example of the rich young man who asked Jesus what was needed to inherit eternal life. The natural love is not sufficient to enter the Kingdom of God – which is humanly impossible and can only come through God’s help in the form of the Divine Love imparted by the Holy Spirit and resulting in soul transformation and the new birth (Matt. 19:16-26). 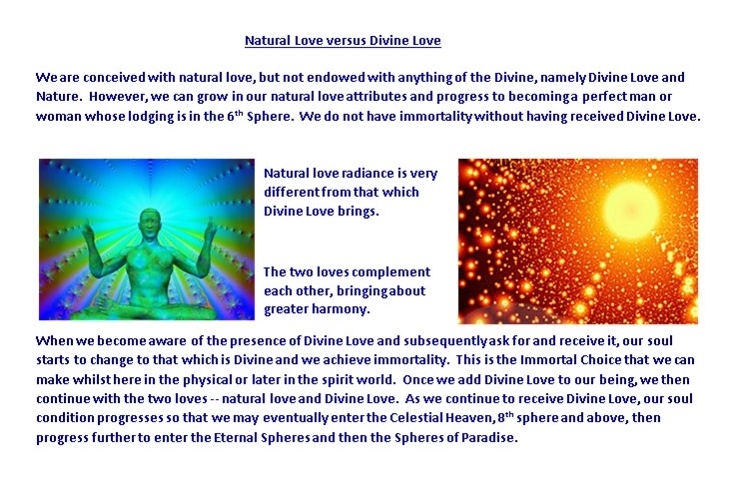 The natural love needs to be absorbed by the Divine Love. If humans, both in their physical life and when they enter the spirit world after death, refuse to ask for and receive the Divine Love, they will remain separated from the Father. As a result, they will only experience the limited happiness – though great from their perspective – that the natural love affords them. In time, however, they will reach a limit to their growth and development, and in addition to their happiness, also experience a certain dissatisfaction. If they are not awakened to the need for the Divine Love, there is nothing divine in them and they will remain in this state with no assurance of immortality or even continuous life. Of course, their existence is sustained by the creating and life-giving Spirit – which is not God, but emanating from God – the universal energy or life force and consciousness in and behind all things (Acts 17:27-28). It is possible for all to seek and receive the Divine Love, but each individual needs to ask for it. Because of the God-given free will, many will not choose the way of seeking it. Also, there may come a time when the privilege of obtaining the Divine Love will be withdrawn. The harmony of the universe is not dependent upon all humans / spirits receiving the Divine Love (and many will not). This is because in the workings of God’s laws of harmony on individual souls, all sin and error will eventually be eradicated and only truth will remain. However, the absence of sin doesn’t mean that all will be equally happy. Those with only the natural love will not be as happy as those with the Divine Love. Yet despite these differences, there will be overall harmony throughout. Adam and Eve had the natural love and were relatively happy, but couldn’t resist temptation. Those in the spirit world with only the natural love too may be subject to temptation and, if it is not resisted, to fall from their state of happiness. By contrast those with the Divine Love become a part of divinity – as if they were very God – and never be subject to temptation or unhappiness. They are destined to live as immortal sinless spirits or divine angels through all eternity in the presence and at-one with the Father.